It supports working capacity, provides brain cells with nutritive substances, improves memory, relieves feeling of hunger quickly, alleviates stress, regulates psychical state, accelerates muscle tissue regeneration, helps the liver to neutralize toxic substances. Glucose – 440.0 mg, excipients. Glucose (or dextrose or grape sugar) is one of the most widespread carbohydrates. Glucose is contained in disaccharides – sucrose, lactose and maltose. It enters the bloodstream quickly in case of high physical loads and is used as a source of energy. Glucose participates in glycogen synthesis, which nourishes brain issues, working muscles (especially the myocardium). Glucose is easily converted in fats in the body especially in case of its excess dietary intake. The main benefit of glucose lies in supporting functioning of such most important physiological processes, as breathing, muscles contraction, heartbeat and body temperature regulation. Glucose improves brain activity, memory capacity and learning ability. In case of glucose deficiency in blood (hypoglycaemia) a person is weak, confused, alert, feeling dizzy, coordination is impaired. Children since the age of 6 take ½ tablets thrice a day, adult stake 1-2 tablets thrice a day. The tablet may be chewed or dissolved in the mouth. 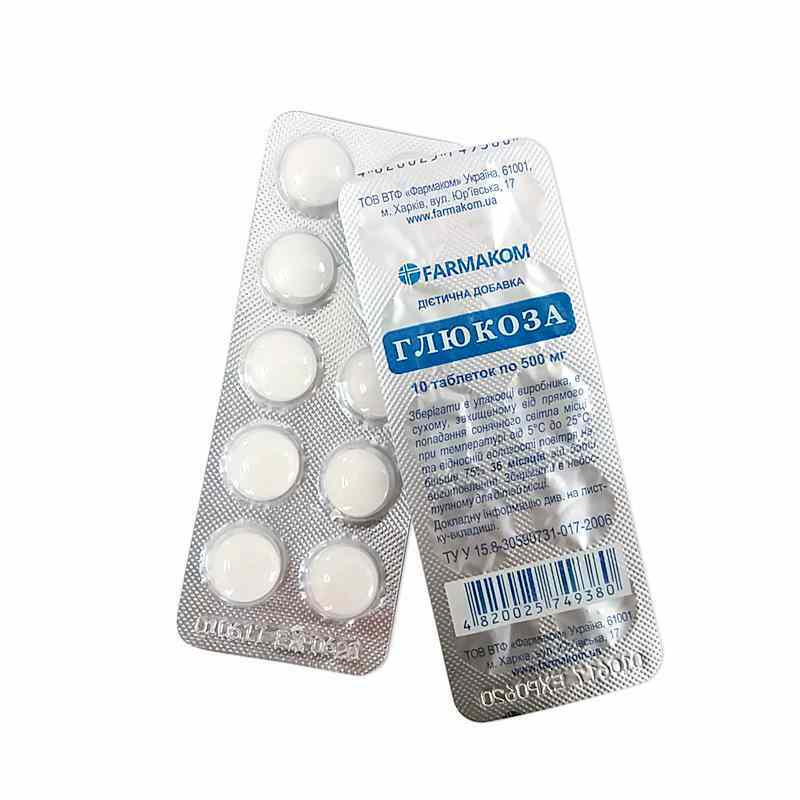 Doses and the term of use are to be agreed with a doctor. Individual sensitivity to certain components, pregnant and lactating women, children under 6. Proteins – 0,04 g, carbohydrates – 90,29 g, fats – 0,008 g.